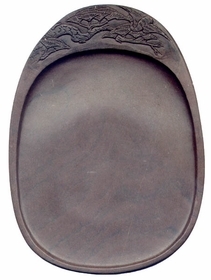 Famous Chinese Duan ink stone carved with pine tree and crane, is displayed in a fitted wooden box. In the Chinese culture, the crane symbolizes longevity (long life); the pine tree symbolizes longevity / eternal youth and steadfastness. To make ink from the ink stick, it has to be ground against the moistened ink stone surface in a circular manner. Depending on the desire for color intensity, the artist will dip the brush upon different areas of the stone. The more water, the less intense the color of the black ink.